Compared with the later "Cheapos", this TI-5100 II and its sibling TI-5200 II feels very strong and solid. It replaced the earlier TI-5112 and featured again everything you need for the daily use on your desktop. 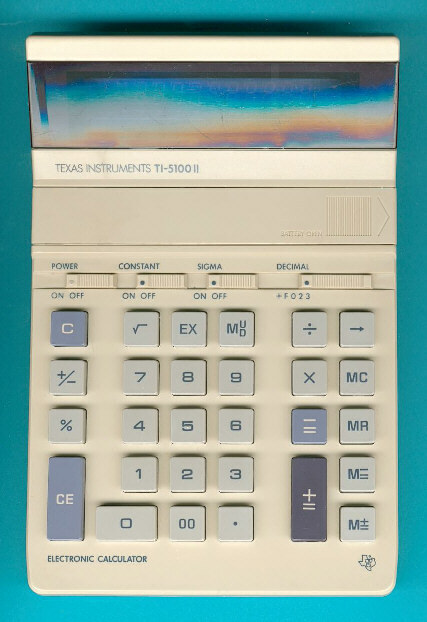 The TI-5020 looks similar but uses solar cells instead the batteries. Please note the perfect access to the batteries between the keyboard switches and the display. Dismantling the TI-5100 II reveals a surprise: The printed circuit board (PCB) tells the manufacturer of this desktop calculator: Toshiba, Japan. Don't miss the US-built TI-5100.